Are you following a dairy-free lifestyle? If so, you’ll want to try this paleo nutritional yeast vegan cheese sauce recipe made with cauliflower. Half of our family has gone dairy-free due to battling auto-immune conditions. So we’ve been exploring various ways to make our favorite recipes without cheese. One of our favorite dishes is lasagna so we looked for a way to make the popular Italian casserole fit into our low carb paleo lifestyle. It’s really just the noodles and cheese that are a no go for us. We decided to use strips of zucchini for the noodle layer for the paleo lasagna. And rather than take the normal route of making a nut cheese, we opted to make a nutritional yeast vegan cheese sauce using cauliflower. After giving the cheese sauce a taste, we knew we had a winner that could be used in other recipes. In fact, we ended up making another batch to use as a dipping sauce for veggies and low carb tortilla chips. The best thing about this paleo cheese sauce is that it whips up quickly in a high speed blender. But you can also use a food processor to puree the ingredients together until smooth. Cauliflower Pearls (pre-chopped cauliflower) saves you the time and trouble of chopping whole cauliflower. Creamy and rich olive oil or ghee adds healthy fat to this delicious cheese sauce. 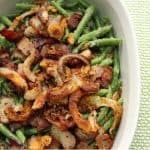 Onion and garlic powder provides the savory flavor that makes it go amazingly well with snacks, salads and meals. To make this amazing dairy-free cheese sauce, we started out by lining a baking pan with cauliflower pieces. Then, we drizzled extra virgin olive oil over them. We then roasted the cauliflower in a 375°F oven until they were tender and slightly golden. That took about 15 minutes. The baking pan was removed from the oven and set on a rack to cool slightly. Then, the roasted cauliflower was added to a blender along with water, salt, lemon juice, and nutritional yeast. After pulsing the ingredients initially together, the mixture was then blended until it was smooth. For additional flavor, onion and garlic powder are added into the mixture. It’s blended again until the consistency is just right for using as a cheese sauce. If needed, additional liquid can be added. But it should be somewhat thick. Drizzle it over broccoli for a super healthy snack. Your kids might not even be able to resist! Or serve it with your favorite pasta. If you’re a carb-lover, use zoodles for a healthier alternative! You can also pour it over baked leeks and smoked salmon. Mm-mmm! This vegan cheese sauce is also a great dip for sweet potato fries. Use this cauliflower cheese with zucchini and arugula salad pizza! Add in some crunchy bacon bits. You can never go wrong with bacon! And you can throw in some jalapeños to add some spice to this cheese sauce. A spicy dairy-free cheese sauce is perfect for nachos! Now when cheese is needed for your favorite casserole, you’ll have a fantastic paleo cheese to replace it with. I’ll admit that I was a little hesitant to use cauliflower as a cheese substitute, but the texture and flavor is perfect for adding cheesy flavor to baked dishes. Although you can find vegan cheese in local markets, many times there’s added corn and potato starch. Unfortunately, corn starch isn’t paleo friendly and it’s something that’s avoided on a grain free diet. We may have to give this sauce a try with our low carb gluten free tortillas. Adding in homemade taco seasoning would give the cheese a nice Mexican flavor. It might work as a taco sauce or in combination with grilled chicken for dairy-free quesadillas. There are certainly many possibilities to use this cauliflower cheese sauce beyond lasagna. You may even want to try adding in some cheesy flavor to our easy paleo meatloaf with bacon recipe. In fact, we used to add mozzarella and parmesan cheese to our old meatloaf recipe before going dairy-free. Are you looking for another way to get your kids to eat their vegetables? Then this cauliflower cheese sauce might be just the thing you need! A vegetable based vegan cheese sauce is proof to picky eaters that eating veggies doesn’t have to be torture. This is a useful trick to have up your sleeve if you have kids who don’t really like eating their greens. They’ll be really surprised to find out that the new sauce smothering their favorite snack is made with cauliflower! This flavorful sauce goes with almost anything! The beauty about this cheese sauce is its versatility. You can prepare it for your lunches, dinners, snacks, lunch boxes and parties! We hope you enjoy this easy paleo cheese sauce recipe as much as we do. If you give the recipe a try, be sure to let us know what you think in the comments below. Are you following a dairy-free lifestyle? If so, you'll want to try this paleo nutritional yeast cheese sauce recipe made with cauliflower. Drizzle cauliflower with olive oil to coat and roast for 15 minutes, until tender and slightly golden. Place cauliflower in blender with water, salt, lemon juice and nutritional yeast. Add in onion & garlic powder. Blend again until you get the consistency that you would like. Serve over your favorite vegetables, as a dipping sauce, over nachos or in lasagna. A terrific recipe and a great alternative for folks who don’t do dairy. Delicious flavors throughout! I’ve been looking for a recipe like this! I can’t wait to try this. Thanks so much for all the tips! Hope it works out for you. My family really enjoyed the sauce in lasagna.